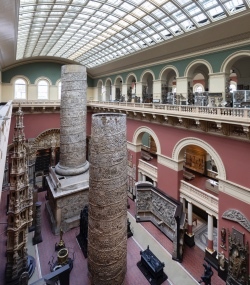 • Carved stone inscriptions, medieval manuscripts and early printed works are among items on display in a new exhibition looking at the act of writing and its impact on human civilisation at the British Library. Writing: Making Your Mark spans five millennia and five continents and includes writing examples from more than 30 writing systems including Greek, Chinese and Arabic. 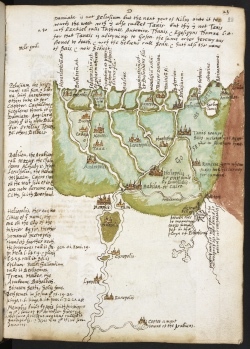 Highlights include an 1,800-year-old ancient wax tablet, early 19th century Burmese tattooing instruments, the final diary entry of Antarctic explorer Captain Robert Falcon Scott, James Joyce’s notes for Ulysses, Caxton’s 1476-7 printing of The Canterbury Tales – the first book printed in England, and the personal notebooks of Elizabethan explorer Sir Walter Raleigh (pictured). 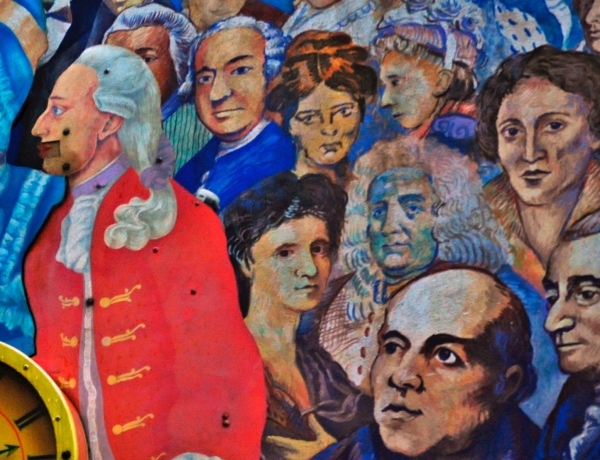 There’s also a 60,000 signature petition from 1905 protesting the first partition of Bengal, Mozart’s catalogue of his complete works from 1784-1791 featuring his handwriting and musical notation, and Alexander Fleming’s notebook in which he recorded his discovery of penicillin in 1928. 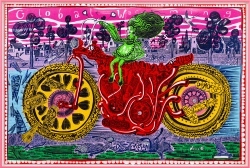 A programme of events accompanies the exhibition which runs until 27th August. Admission charge applies. For more see www.bl.uk. 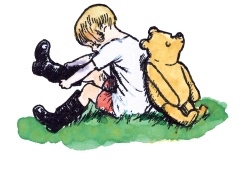 PICTURE: © British Library. • London’s forgotten rivers, tunnels, sewers, deep shelters, and the world’s first subterranean railway are all explored in a new free exhibition at the London Metropolitan Archives in Clerkenwell. Under Ground London in part celebrates the 200th anniversary of the birth of Victorian engineer Sir Joseph Bazalgette – who designed the scheme to overhaul the city’s sewers in the 19th century. As well as Bazalgette’s landmark work, the exhibition explores the legend of a cobbled street buried beneath today’s Oxford Street and tells the story of the Thames Tunnel which, when it opened in 1843, was the world’s first tunnel under a river. There’s also information on London’s ‘ghost stations’, including Strand and King William Street; and the Metropolitan Railway – the world’s first underground railway as well as images of the River Fleet, displayed for the first time. The display can be seen until 31st October. For more, follow this link. 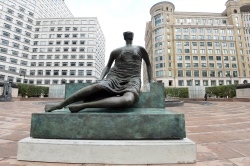 • Women artists working in Britain in the past 60 years are being celebrated in a new display at the Tate Britain in Millbank. Sixty Years features about 60 works spanning painting, photography, sculpture, drawing and film and includes many recent acquisitions. Artists whose works are on show include Mona Hatoum, Sarah Lucas, Bridget Riley, Mary Martin and Anthea Hamilton. Highlights include Gillian Wearing’s film Sacha and Mum (1996), Susan Hiller’s large scale multimedia installation Belshazzar’s Feast, the Writing on Your Wall (1983-84), and two new mixed media works by Monster Chetwynd – Crazy Bat Lady (2018) and Jesus and Barabbas (Odd Man Out 2011) (2018). For more, see www.tate.org.uk/visit/tate-britain. This five star luxury Mayfair hotel opened in 1931 and quickly established a reputation for luxuriousness. Located at 35 Park Lane on the site of what was formerly the London residence of the Earl of Dorchester (and later a mansion built for millionaire RS Holford), the hotel was the dream of Sir Robert McAlpine who bought the site in partnership with Gordon Hotels in 1929 for £500,000 and vowed to create a luxury hotel that would “rank as the finest in Europe”. Engineer Sir Owen Williams initially oversaw the building’s design but a falling out saw architect William Curtis Green take over the project (meaning while the structural frame was Sir Owen’s work, the elevations are largely the work of Green). A quarter of the building was constructed underground. When the 10 storey modernistic building was opened on 18th April, 1931, by Lady Violet Astor, it featured luxurious rooms and suites (with, apparently, the deepest baths of any hotel in London), a ballroom built to accommodate 1,000, an Oriental Restaurant and, of course, the Dorchester Bar (it was here the ‘Dorchester of London’ cocktail was invented). 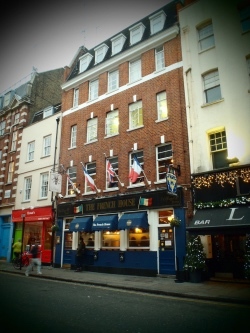 The Dorchester survived World War II with only minor damage (its basement served as an air-raid shelter). In fact, during World War II, such was the reputation of its reinforced concrete structure, that UK Cabinet members including Lord Halifax stayed here while US General Dwight D Eisenhower planned the D-Day invasion from his suite – now the Eisenhower Suite – during World War II. In the 1950s, stage set designer Oliver Messel revamped various aspects of the hotel including designing some suites in an extension in Deanery Street (the Oliver Messel Suite is named for him). The hotel has hosted its share of the rich and famous – Prince Philip hosted his bachelor party in the hotel’s Park Suite on the eve of his wedding to Queen Elizabeth II in 1947 (the Queen, meanwhile, had dined there the day before the engagement was announced), and actors Richard Burton and Elizabeth Taylor used the hotel as something of a “second home”. Other notable figures who have stayed at the hotel include writers Cecil Day-Lewis and Somerset Maugham, painter Sir Alfred Munnings, director Alfred Hitchcock and film stars Gloria Swanson, Marlene Dietrich, Danny Kaye and James Mason as well as Tom Cruise, Meg Ryan and Nicole Kidman. 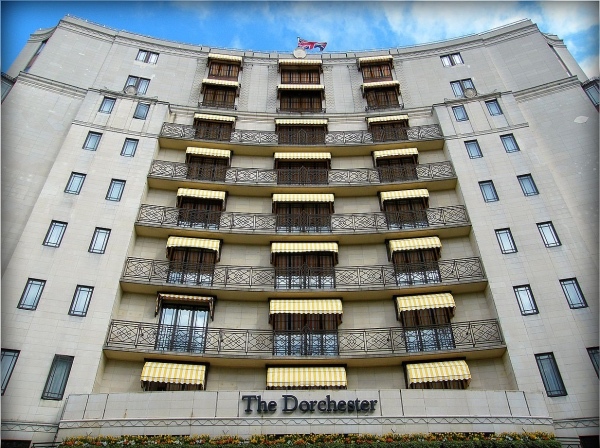 The Dorchester was listed as a Grade II building in 1981 and, having been sold by the McAlpine family to a consortium headed by the Sultan of Brunei in the mid-1970s, it was purchased outright by the Sultan of Brunei in the Eighties (and later transferred ownership to the Brunei Investment Agency). The hotel was completely renovated between 1988 and 1990 and was again refurbished in 2002. Facilities today at the hotel – alongside the 250 rooms and suites – include numerous restaurants and bars such as the three Michelin star Alain Ducasse at The Dorchester, China Tang, The Spatisserie and The Grill at the Dorchester, as well as The Bar at the Dorchester and The Promenade where afternoon tea is served. There’s also a spa. Today The Dorchester is the flagship of the Dorchester Collection of hotels which also includes 45 Park Lane, Cowarth Park in Ascot, The Beverly Hills Hotel and The Hotel Bel-Air in LA, the Hotel Eden in Rome, Le Meurice and Hotel Plaza Athenee in Paris and the Hotel Principe di Savoia in Milan. Out the front of the hotel is a London Plane tree which was named one of the “great trees of London” in 1997. Located in the churchyard of St Pancras Old Church, the Hardy Tree takes its name from its association with novelist Thomas Hardy. Before Hardy found fame as the author of such novels as Tess of the D’Urbervilles, The Mayor of Casterbridge and Far from the Madding Crowd, in the 1860s he worked as an assistant to a West End-based architect, Arthur Blomfield. Blomfield’s firm, in order to make way for a new line for the Midland Railway, was commissioned by the Bishop of London to exhume bodies from their graves in the churchyard and relocate them. Hardy was given the job of supervising the removal of the corpses – apparently among those exhumed was a coffin containing a man with two heads! It’s said that after he had removed the bodies, Hardy had to decide what to do with the headstones which remained and came up with the idea of placing them in a rather lovely fanned collar around an ash tree growing in a part of the churchyard unaffected by the railway line. Whether Hardy was actually responsible for the placement of the gravestones remains somewhat uncertain (although it’s a nice story). But his work in the graveyard is believed to have at least partly inspired his poem, The Levelled Churchyard. 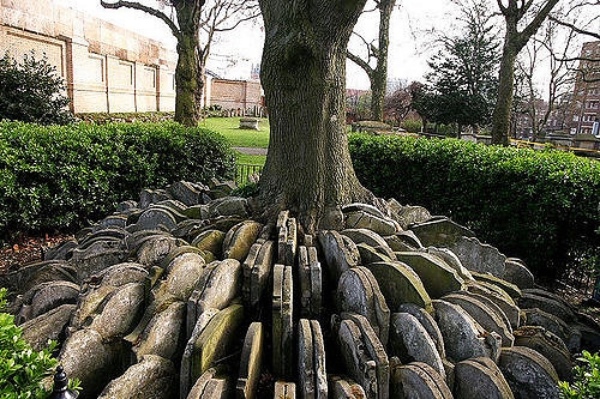 The moss-covered gravestones and tree have since merged and now make a fascinating monument to the churchyard’s past life, attracting Hardy pilgrims from across the world. And, of course, the churchyard is also famous as the site where Mary Shelley, author of Frankenstein, planned her elopement with poet Percy Bysshe Shelley, while she was visiting the grave of her mother, Mary Wollstonecraft not to mention Charles Dickens’ famous reference to it in A Tale of Two Cities and its association with so-called ‘resurrection men’ or ‘bodysnatchers’ in the 19th century. This year marks 200 years since the publication of Mary Shelley’s book, Frankenstein: or, The Modern Prometheus, so it’s timely to have a look at the life of this famous Londoner. Shelley was born on 30th August, 1797, in Somers Town, London, to feminist philosopher Mary Wollstonecraft and political philosopher, novelist and journalist William Godwin. Her mother died soon after her birth, leaving her upbringing to Godwin (and his second wife Mary Jane Clairmont who apparently didn’t get on with Mary). While she received little formal education, she was tutored in a range of subjects – everything from literature to art, French and Latin – by her father and visiting tutors. Godwin described her as having a great desire for knowledge. She first met her future husband, the Romantic poet Percy Bysshe Shelley, while still a teenager. Shelley, who was estranged from his wife, had struck up a friendship with her father and was subsequently a regular visitor to their house. Mary and Percy began secretly meeting each other at Mary Wollstonecraft’s grave in St Pancras Churchyard and then on 28th June, 1814, the couple eloped to France, taking Mary’s step-sister Claire Clairmont with them but leaving Shelley’s pregnant wife behind. They went on to Paris and then, through war-ravaged France, to Switzerland. At Lucerne, however, a lack of money forced them to turn back and they returned to London where Mary’s father refused to have anything to do with her. Now pregnant, Mary and Shelley moved into lodgings with Claire in Somers Town and later in Nelson Square where they were known for entertaining his friends. Shelley’s wife, meanwhile, gave birth to his son – something that must have been hard for Mary – and it is believed that he was also a lover of Mary’s step-sister Claire. Mary gave birth to her first child, a daughter, on 22nd February, 1815, but she died just 12 days later. That same year, the death of Shelley’s grandfather brought himself considerable wealth and with their financial situation now relieved, in August, 1815, they moved to Bishopgate, in Windsor Great Park. In January, 1816, Mary gave birth to her second child, a son, William. In May, 1816, the couple travelled with their son William and Mary’s step-sister Claire to Geneva in Switzerland where they hoped to improve Percy’s health. It was during the time they spent there that a ghost-writing contest in June, 1818, led her to write what would be the basis of the novel Frankenstein – credited with introducing genre of science fiction into English literature. Returning to England, the Shelley’s took up residence in Bath (Clairmont was pregnant by Lord Byron and they wanted to keep this from the Godwins). Harriet Shelley, Percy’s estranged wife, drowned herself in the Thames on 9th November and it was following that, that on 30th December, Mary and Percy married at St Mildred’s Church in London with Mary’s father and step-mother as witnesses. In March, 1817, the Shelley’s took up residence in Marlow where Mary gave birth to second daughter, Clara Everina Shelley, on 2nd September. Then in March, 1818, the family – along with Claire Clairmont and her daughter – travelled to Italy where it was hoped the warmer climate would help Shelley, who had been diagnosed with pulmonary disease. There they lived at various addresses and were in Venice when Clara died of dysentery on 24th September, 1818. They traveled to Rome in April the following year and there, on 7th June, William died of malaria, leaving the couple devastated. Their fourth child and only surviving child, Percy Florence Shelley, was born in Florence on 12th November. Their Italian sojourn continued for the next couple of years until, on 8th July, 1822, Percy Shelley and his friend Edward Williams were drowned in a squall in the Gulf of Spezia. 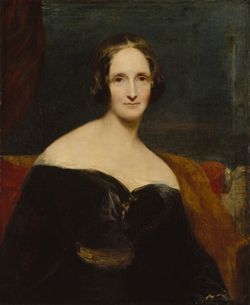 Determined to show she could write and look after her son, Mary Shelley returned to England in mid-1823 and lived in The Strand with her father and stepmother until in the summer of 1824 she moved to Kentish Town. Her novel, The Last Man, was published in 1826 followed by The Fortunes of Perkin Warbeck (1830), Lodore (1835), and Falkner (1837) as well as working on numerous other writing projects. Shelley never remarried although she was linked to various men romantically including American actor John Howard Payne whose offer of marriage she rejected. After her son Percy left university in 1841, he came to live with her and between 1840 and 1842 Shelley travelled to various locations in Europe with her son. Sir Timothy Shelley, Percy Bysshe Shelley’s father, died in 1844 with the result that Shelley and her son were now financially independent. Percy married Jane Gibson St John in 1848 and Mary lived her son and daughter-in-law, splitting their times between the ancestral Shelley home – Field Place in Sussex – and Chester Square in London as well as accompanying them on their travels overseas. Shelley suffered considerable illness in the last years of her life – including debilitating headaches and bouts of paralysis in her body – before on 1st February, 1851, she died at the age of 53 from a suspected brain tumour at the Chester Square property. She had asked to be buried with her mother and father, but Percy and Jane instead buried her at St Peter’s Church in Bournemouth closer to their home. In order to fulfill her wishes, they had the bodies of her parents exhumed from St Pancras graveyard and reburied with her. Despite gaining respect as a writer in her own lifetime, Shelley’s reputation in the literary arts was overshadowed by that of Percy’s after her death. But in more recent decades her overall writing career has come to be more closely examined and applauded. 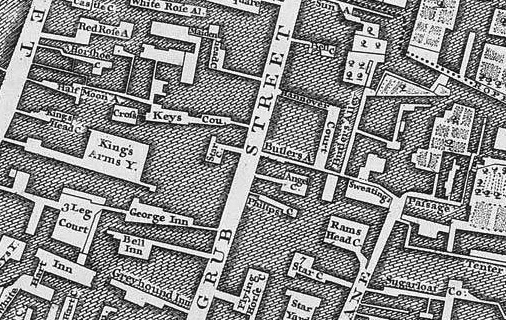 If you missed it, for more on Mary Shelley’s links with London, see our special series 10 sites from Mary Shelley’s London. 1. Poland Street, Soho. Shelley lived at number 15 after he was expelled from Oxford University in 1811 for publishing a pamphlet on atheism. He wasn’t here long – in August he eloped with Harriet Westbrook, then just 16, to Scotland. 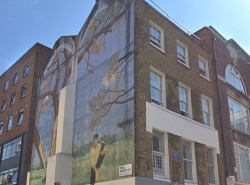 The building, which stands on the corner with Noel Street, features an English Heritage Blue Plaque and there’s a massive mural on its side, Ode to the West Wind, which takes its name from a poem he wrote in 1819. It was painted by Louise Vines in 1989. PICTURE: Google Maps. 3. Westminster Abbey. There’s no memorial to Mary Shelley in Westminster Abbey but in Poet’s Corner – located in the South Transept – you will find a small memorial to her husband. 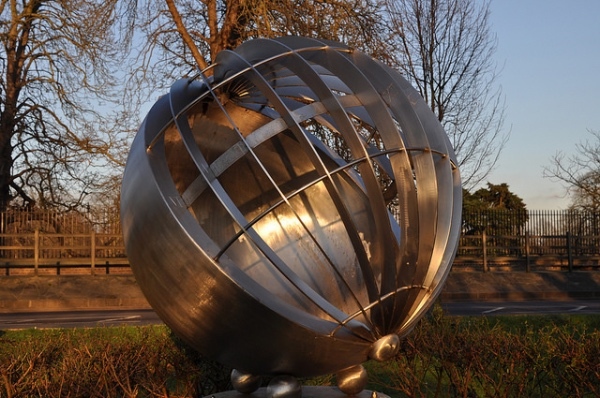 The joint memorial (which also commemorates John Keats) was designed by sculptor Frank Dobson and unveiled in 1954 by then Poet Laureate John Masefield. It simply features two plaques – one bearing the name Shelley and the other Keats with their birth and death years – linked by a “swag of flowers” attached to a lyre at the top of each plaque. 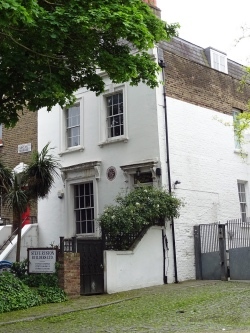 Renowned sibling writers Charles and Mary Lamb lived in a property at 64 Duncan Terrace in Islington from 1823-27 and, their visitors there apparently included Mary Shelley. Shelley had returned to London in 1823 after the death of her husband Percy Bysshe Shelley who had drowned along with two other men off the coast of Italy in July the previous year. Back in London, Shelley lived in various properties as far afield as Kentish Town – many of which are no longer extant. But one home she was known to have visited after her return (which is still standing) was that of the Lambs. Charles, part of the literary circle which included Samuel Taylor Coleridge and William Wordsworth, described the property – Colebrook Cottage – as a “white house with six good rooms”. Now Grade II-listed, it dates from the 18th century. The New River once ran close by – so close, in fact, that one guest, believed to be the blind poet George Dyer, walked into the river after leaving the house and had to be rescued by Lamb. The river is now covered. The property features an English Heritage Blue Plaque (although in this case, it’s actually brown), commemorating Lamb’s stay here. PICTURE: Spudgun67 (licensed under CC BY 2.0). The publishers of the first edition of Frankenstein – a company known as Lackington, Hughes, Harding, Mavor and Jones – were based in Finsbury Square in Islington within a building known as The Temple of the Muses. Designed as a ‘temple to reading’ (it is attributed by some to George Dance the Younger), the rather grand building in the south-east corner of the square was built by the aforementioned James Lackington in 1791 to sell books (his stocks grew to include tens of thousands of items), some of which the company would publish themselves. 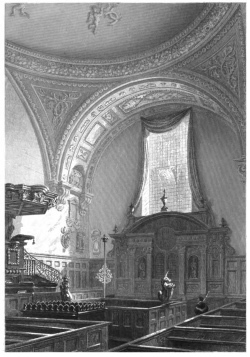 The massive building was crowned a central dome topped with a flagpole (from which a flag fluttered when Lackington was in residence) under which was a circular counter around which it was apparently said a coach and horses could be driven see image). 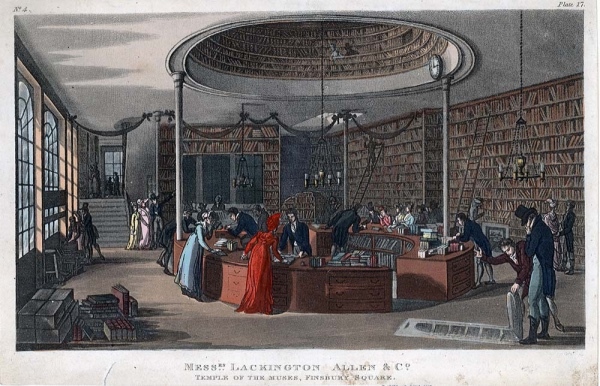 The original Lackington had long since retired from the business when Mary Shelley came along. His relative George Lackingham then ran the business with many partners – Richard Hughes, Joseph Harding, William Mavor and a Jones. Known consequently as Lackington, Hughes, Harding, Mavor and Jones, the company had apparently previously had a couple of different names including Lackington, Allen & Co.
Frankenstein; or, The Modern Prometheus was first offered as a three volume book – without Shelley’s name attached – to the public on New Year’s Day, 1818 (slightly behind schedule due to printing delays). Thanks to the initial print run being late and an advertising mix-up, it was subsequently republished on 11th March the same year (this is now considered by many the original publication date). The Temple, meanwhile, survived until 1841 when it burned down. 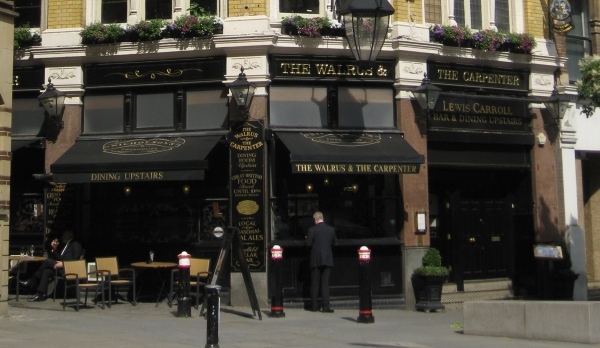 The business, now known as Harding and Lepard, then moved to Pall Mall East. • Beloved children’s author, PL Travers – she of Mary Poppins fame – has been commemorated with an English Heritage Blue Plaque. The plaque was installed at 50 Smith Street in Chelsea where the Australian-born Travers lived for 17 years and which is said to have been the inspiration for the Banks’ family home in the Disney film, Mary Poppins. Travers took up residence in the house in 1946, after returning to the UK from the US where she’d lived during World War II. It was here that she raised her adopted son, John Camillus Hone, and it was the property she was living in when she negotiated with Walt Disney for the rights to make a film about her famous book. She left the premises in 1962. 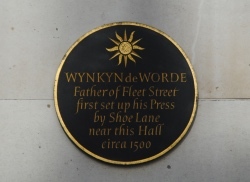 For more, see www.english-heritage.org.uk/visit/blue-plaques/. • An exploration of how symbols encapsulating Egypt’s ancient past have been appropriated in more modern times has opened at the British Museum. The Past is Present: becoming Egyptian in the 20th Century brings together 31 objects gathered through the museum’s ‘Modern Egypt Project’ as it explores how the nation has branded itself by drawing on the past. The items on show include pasta packaging and cigarette boxes depicting the pyramids, milk bottles with a Cleopatra logo, and the emblem of the Banque Misr (Bank of Egypt), the first bank owned and operated by Egyptians. This Asahi Shimbun Display is free to see and can be viewed in Room 3 until 30th September. For more, see www.britishmuseum.org. Formerly known as Walnut Tree Island (among other names), this Thames River island, which lies just upstream of Hampton Court Place, was once a playground for the wealthy and is now home to about 100 residents living in houseboats. The island was once part of the manor of Hampton Court and by the mid-19th century was home to a number of squatter families who made a living by harvesting osiers (willow rods) used in basket weaving. In 1850, it was purchased by a property speculator and lawyer Francis Kent (another name for the island was Kent’s Ait) who evicted the squatters and rented part of the island to Joseph Harvey, who established a pub called The Angler’s Retreat there. Another part he leased to a local boatbuilder and waterman named Thomas George Tagg who set up a boat rental and boat-building business there. In the 1870s, Tagg – whose name became that of the island’s – took over the licence of the pub and built a larger, more imposing hotel in its place, transforming the backwater establishment into a high society favourite. Among its patrons were none other than Edward, Prince of Wales (later King Edward VII) and the actress Sarah Bernhardt. The island also become a mooring site for luxurious houseboats and by the 1880s, the island was ringed with the craft – among those who rented one was none other than JM Barrie, later the author of Peter Pan. In 1911, Tagg’s original lease of the island ran out and it was subsequently taken by Fred Karno (formerly known as Fred Westcott), a theatre impresario who is credited with having ‘discovered’ Charlie Chaplin and Stan Laurel and who had stayed in houseboats on the island. 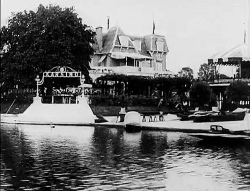 He subsequently built a luxurious hotel there, The Karsino, which he sold in 1926, but which went on to change hands several time over the ensuring years (and names – it became known variously as the Thames Riviera and the Casino Hotel). Eventually, in a badly dilapidated state, the hotel once known as The Karsino was demolished in 1971 (but not before putting in an appearance in Kubrick’s A Clockwork Orange). Karno also owned a luxurious houseboat, the Astoria, which was once moored on the island but which is now owned by Pink Floyd guitarist David Gilmour (who adapted it into a rather stylish recording studio in the Eighties – A Momentary Lapse of Reason and The Division Bell were apparently both recorded here) and moored upstream on the northern bank of the Thames. A road bridge was built to connect the island to the mainland in the 1940s – when the island was being used to produce munitions – but this collapsed in the 1960s. A new bridge was built to the island in the 1980s and a small lagoon carved out of the centre to increase the number of mooring sites for houseboats. No homes are these days permitted to be constructed on the island but it’s still a mooring place for houseboats, some 62, in fact. 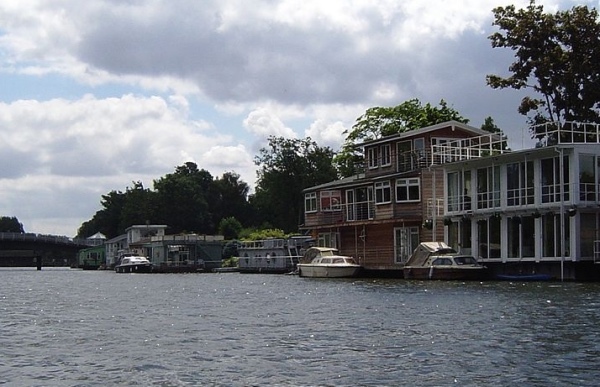 These days the island owned by an association of the houseboat owners who each have their own garden on the island. In the centre of the island is a rather unique sundial (see below). And just to the south-east of Taggs Island lies the much smaller Ash Island; the stretch of water separating the two was apparently once known as Hog’s Hole. Famous for its mentions by Charles Dickens, Jacob’s Island – located in Bermondsey – was not actually a true island. It was a small parcel of land formed into an “island” thanks to its location in a loop of the Neckinger River and, on the south side of the loop, a man-made ditch which was used as a mill run for Bermondsey Abbey. It was most famously mentioned in Charles Dickens’ book, Oliver Twist and was where the notorious Bill Sikes died in the mud of ‘Folly Ditch’ – a reference to the ditch surrounding the island – as he attempted to elude the authorities. 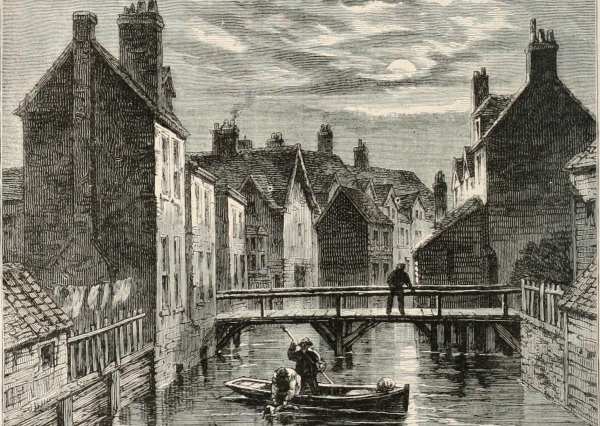 Dickens describes Jacob’s Island in the book as a place “where the buildings on the banks are dirtiest and the vessels on the river blackest with the dust of colliers and the smoke of close-built low roofed houses, there exists the filthiest, the strangest, the most extraordinary of the many localities that are hidden in London”. In the preface to the 1867 edition of the book, he even wrote of its ongoing existence which was apparently doubted by one City alderman, saying “Jacob’s Island continues to exist (like an ill-bred place as it is) in the year one thousand eight hundred and sixty-seven, though improved and much changed”. 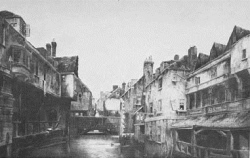 The slum itself existed until the late-1800s – much of it was razed in a fire of 1861 – in subsequent decades, the ditches surrounding it were filled in and the area redeveloped into warehouses. The River Neckinger, incidentally, is one of London’s ‘lost rivers’. Its name means ‘devil’s neckerchief’ or ‘devil’s necklace’ – a reference to the hangman’s noose – and it is believed to refer in here to the gibbet from which pirates were hung close to the mouth of where the river entered the Thames at nearby St Saviour’s Dock and where their bodies left to deter others from taking a similar path. PICTURE: Top – Jacob’s Island and Folly Ditch, an engraving from a book published in 1873 (Internet Archive Book Images/licensed under CC BY-SA 2.0); Right – ‘Folly Ditch’, pictured here in about 1840.